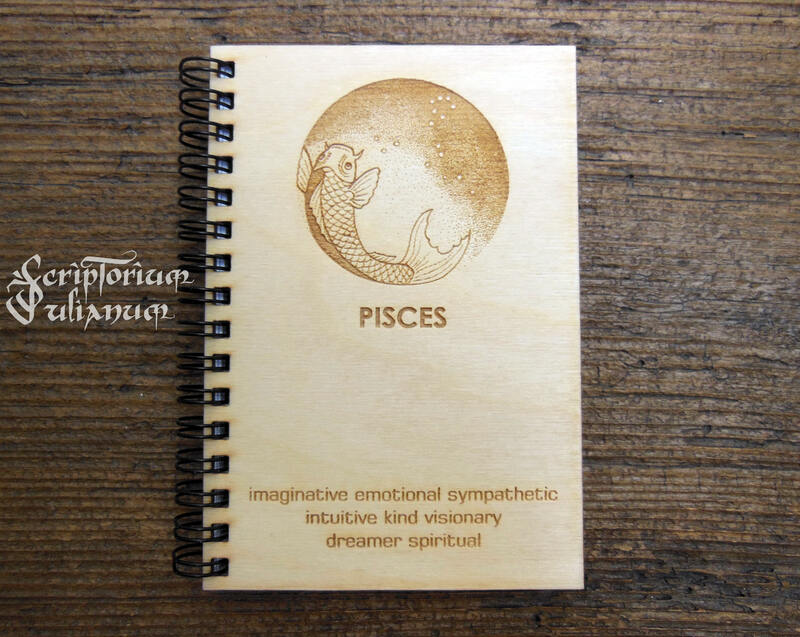 A wooden cover journal with engraved Pisces art (own design by Scriptorium Julianum). Elegant and affordable gift for someone born between February 18 - March 20. 64 sheets (132 pages), laminated brown back cover. Laser cut and engraved, hand-bound with wire spiral, hand sanded and assembled with love and care. Smooth in touch, with a gentle smell of wood. Sizes: 9,5x14 cm (3,7x5,5 inches), 14,5x19 cm (5,7x7,5 inches), 19x29 cm (7,5x11,4 inches). We send our products by priority post with a tracking number. Normal times of delivery are approx. 2-5 weeks (Europe) and 4-8 weeks (rest of the world). USA & CANADA: PLEASE NOTE that this shipping option is not trackable in your countries. This are wonderful! The cut and wood burning is perfect! Beautiful! I’m soooo happy with this! I will be ordering one for each Sabbat!